While I love the smell of delicious goodies baking in my oven, I always appreciate a simple and no fuss treat like these chocolate balls. This is especially true in the warmer months so I don’t have to heat up my house. My mom made these scrumptious candies as a special Easter treat. Of course she made them along with several other varieties because she doesn’t know how to make one kind of anything in the kitchen. But I love her for it and it always makes every visit even more special to discover what treats are sitting on the kitchen counter. 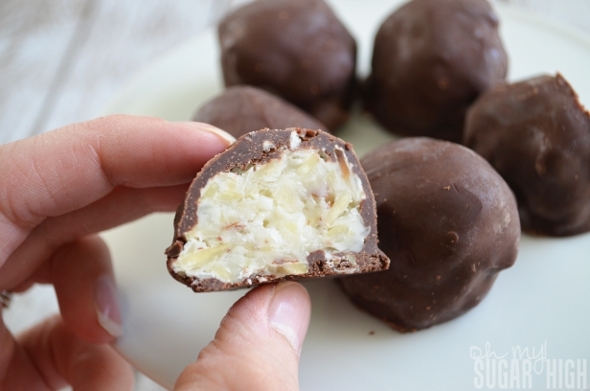 These poor coconut candies took a little bit of a beating on my way home (the chocolate was perfectly smooth before we left) but I still had to share the recipe and pics because they are too delicious not to share. 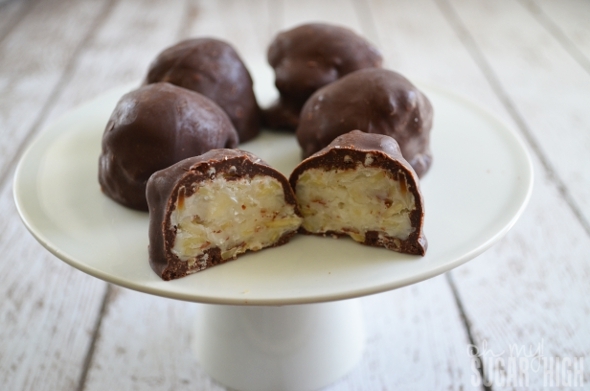 Combine confectioners' sugar, coconut, almonds and milk in a large bowl and shape into balls. (About one inch). Place in fridge and chill until firm, about 20 minutes or so. Melt chocolate chips and shortening in microwave on high for 1 minute. Stir and microwave 10 to 20 seconds at a time and stirring until smooth but not overheated. 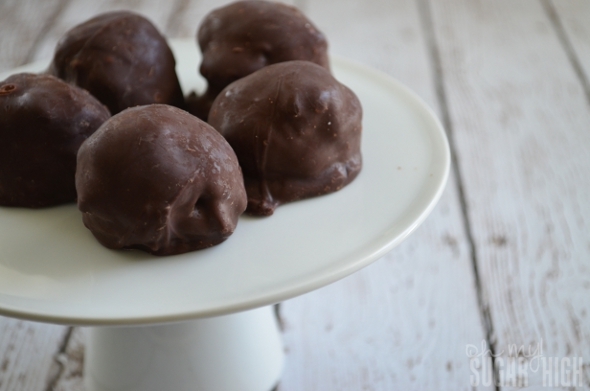 Dip balls in chocolate, allowing excess to drip off. Use the optional ingredients to coat or garnish the top of each ball if desired. Place on waxed paper or silicone baking sheet until set. Store in an airtight container. Makes approximately 2 1/2 dozen candies. 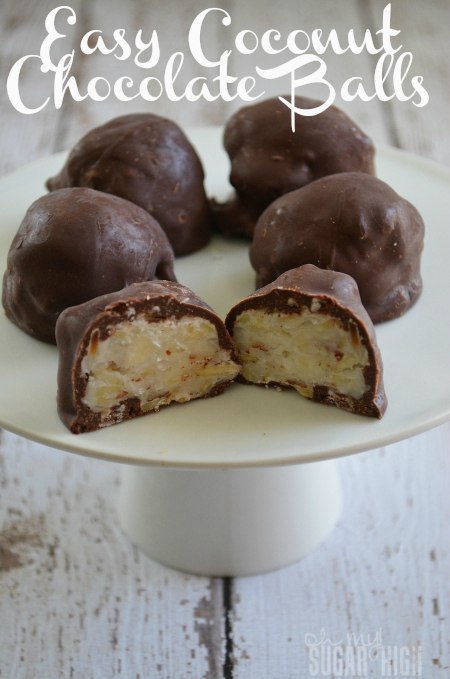 If you love coconut, you’ll love these! You can find this recipe and many more at Taste of Home. I’m allergic to tree nuts. Do you think they will hold together without the almonds or should I try to find a substitute? Maybe crushed pretzels? You can make them with or without nuts. My grandma used to make these for Christmas every year but called them Martha Washington Balls. She also made 1/2 with minced cherries in them. I make them now for special occasions and everyone loves them! Absolutely! You can use whatever coating you would like. Wilton candy melts would also work. Thanks for stopping by! What kind of cherries? Marachino, dried cherries, or candied cherries? People, please be more specific!!! I am so excited to make these! I love coconut especially with chocolate. It’s just so delicious!